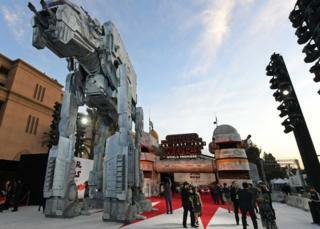 Stormtroopers, an AT-AT Walker and a panoply of droids brought the Star Wars universe to downtown Los Angeles at the premiere of The Last Jedi. The much-anticipated first screening of the franchise's latest episode was dedicated to the late Carrie Fisher, who died last December aged 60. Writer-director Rian Johnson opened the screening with a tribute, urging fans to "have a blast... for Carrie". "I want to dedicate tonight to Carrie, who is up there right now flipping me the bird, saying 'Damn it Rian, don't you dare make this night a solemn tribute,'" said Johnson, who brought the stars of the film onstage to introduce it. Formal reviews of the film have been embargoed until later in the week, but guests at the premiere have already been pouring out their thoughts on social media. Joshus Yehl, editor of IGN Comics, said he gasped, laughed, screamed and cried at what might be "the best Star Wars movie ever". Grae Drake, a senior editor with movie and TV review site Rotten Tomatoes, described it as "as epic and sweeping as all the other films combined" with moments "that will make your head pop off" - in a good way. Film critic Scott Mantz said The last Jedi was "a little too long and dragged in the middle", but said it was a "worthy Episode VIII" - and that Luke Skywalker actor Mark Hamill was "awesome". Meanwhile, Mark Hamill himself referenced the lyrics to the Beatles' Sgt. Pepper's Lonely Hearts Club Band with a tweet from the auditorium, ending with a plea to fans to "keep the secrets of VIII". Star Wars: The Last Jedi (Episode VIII in the movie franchise that started in 1977) follows on from the 2015 film The Force Awakens, and opens with the Resistance trying to fight off Supreme Leader Snoke's First Order, which is trying to take over the galaxy. Meanwhile, leading character Rey (Daisy Ridley) is trying to persuade Luke Skywalker (Mark Hamill) to join the Resistance fight and bring a spark of hope to the rebels. "There hasn't been a Star Wars movie yet that has explored war the way The Last Jedi has," said John Boyega, who plays the heroic stormtrooper-turned-rebel Finn. "It's very messy. The categorising of good and evil is all mixed together." Oscar Isaac, who plays X-wing fighter pilot Poe Dameron, added: "It's a dire situation, it's critical. The Resistance is on its last legs. "When you're trying to survive, the First Order's right on top of us, it is like war, where you've got to keep moving to try to survive. You feel the momentum of everything that happened in The Force Awakens just pushing to a critical mass." Experts are predicting the movie - which opens on 15 December - will gross about $220m (£164m) on its opening weekend in the United States. That would push it into second place on the all-time list, ahead of Jurassic World but behind 2015's The Force Awakens, which made some $248m on its opening weekend. Gwendoline Christie, who plays stormtrooper commander Captain Phasma, said the franchise had an enduring appeal. "I think it's because the world we live in is a changing and evolving place that it retains the simplicity of those elements," she said. "But it really resonates with what it is to follow your own human, dark, narcissistic tendencies, where that will take you."